The Cleveland Movie Blog: Only the truth (so Trump and Hillary need not apply) at the Chagrin Documentary Film Festival Oct. 5-9. Only the truth (so Trump and Hillary need not apply) at the Chagrin Documentary Film Festival Oct. 5-9. 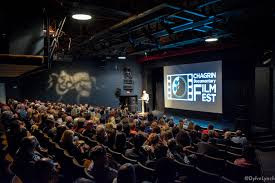 The Chagrin Documentary Film Festival, now in its seventh year, is a unique competitive film-festival event that has rapidly become a top-ticket for local filmgoers. The only drawback: it’s all true. Sorry, no superhero adaptations – but there is DRAW HARD, the short portrait of John G, a Cleveland comics creator of graphic material more or less in the Harvey Pekar tradition rather than the Marvel one. Sorry, no OCEANS 11 sequel/reboot/prequel casino caper, but instead WRESTLING ALLIGATORS, a feature about how Florida’s Seminole Indian tribe, one of the few First Nations peoples not carted off to wasteland reservations by the US government, became a billionaire success story in the gambling-hospitality industry. Sorry, no lost-in-limbo MRS. DOUBTFIRE II that Hollywood dearly wanted to make before Robin Williams’ suicide, but instead there’s UNCLE GLORIA: ONE HELLUVA RIDE! Which purports to be a actual story of a macho homophobe adopting a transvestite disguise after a bad divorce. The CDFF takes place from Wednesday, Oct. 5, through Sunday, Oct. 9, at venues throughout the famously postcard-pretty village of Chagrin Falls on the eastern side of Cuyahoga County. Screening and special-events sites range from the Chagrin Valley Little Theater to the old Township Hall to United Methodist Church. Films begin as early as noon on Wednesday (with a double-shot, the short SPIRIT OF CINCINNATUS, about a grassroots mural-arts program for kids in city Cincinnati, paired with the world premiere of the short feature NANCY CORRIGAN: SKY BLAZER, about a pioneer aviatrix). The official Festival opening bash happens at 7 p.m. Wednesday at the Chagrin Valley Little Theatre, with the midwest premiere of CHASING THE WIN, about thoroughbred horse-racing jockey Carl O’Callaghan. O’Callaghan and co-director Laura Sheehy will be present to answer questions after the presentation. Otherwise, tickets to features and feature-length short-subject bundles are $10 and can be purchased in advance at Chagrin Falls Township Hall (during 11 am to 3 pm. and via the festival website. Other payment plans are available, right up to the all-access festival pass of $75. A near-to-closing awards presentation featuring Jan Jones and Bonnie Barenholtz, takes place Saturday, Oct. 8 at 8 p.m. at the Chagrin Valley Little Theater. For full information and schedules, go online to www.chagrindocumentaryfilmfestival.org.